Hello Ben, I bought this truck in 2008 from Brian Huard. It is now in Texas and after owning it 6 years. I've finally started working on it. 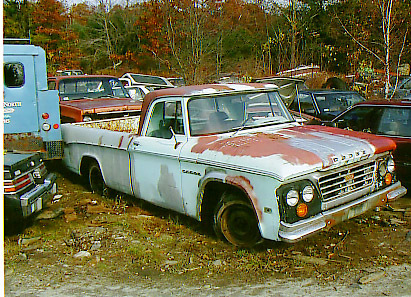 I purchased a 1965 Dodge D100 CSS on November 1, 2003 from a local junkyard here in Massachusetts. The junkyard owner said he picked up the truck from a nearby town. Evidently the parents of a young boy thought the truck was too much of a project for him. The junkyard owner said he felt bad when he saw upset the boy was, but told him it wouldn’t be scrapped. I was looking for a bed to replace the camper that was attached to the chassis of my 1967 Dodge D200 truck. It is a great low mileage (52,000) vehicle with PS, PB, Automatic and a 383 to boot!! I saw the 65 and started looking it over noticing it had NO rust!! It looked pretty rough all over and after talking to the owner, I found out it was originally a California vehicle. 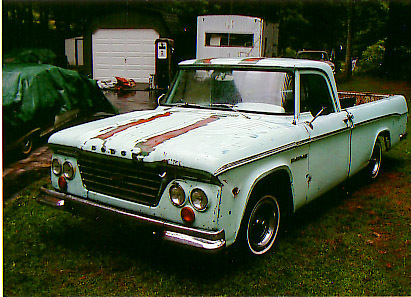 I previously owned a 1966 CSS so I was aware of the oddities of these rare trucks. Lifting the hood up on the 65 I saw the remains of the 4 black stripes. Someone had at one point removed the stripes on the hood and roof as you can see in the picture. I struck a deal with the owner and had it delivered the next day. I have since found an NOS carburetor to replace the missing one. 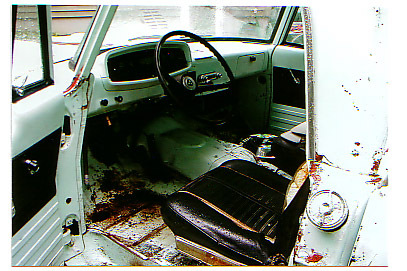 I found nice bucket seats from a 64 or 65 Dart. I also replaced the corroded fuel tank with a nice clean one. I haven’t been able to find the original console as it to was missing.